Buying the perfect kitchen faucet for your RV is important because it can make or break the interiors of your travel home. It can be an overwhelming decision because there are so many options to choose from. Before you start going through options, there’s some background work you need to do so that you don’t spend too much time making a choice. When it comes to buying an RV kitchen faucet, you have to be extra careful as the size matters a LOT. Not all sink designs and kitchen faucet patterns go together, so you need to find out what is the design of your kitchen sink. You also need to check how many faucet hole the sink design has as it allows you to opt for a kitchen faucet that comes with multiple features. The kitchen faucet should be compatible with your RV’s water supply lines. Check the water line size and shut off valve size under the sink. New faucets usually are fitted with 3/8″ flex lines but sinks come with 1/2″ flex lines. If that’s the case, then you will have to change the sink shut off valves to 3/8″ flex lines. You are constrained for space in an RV. 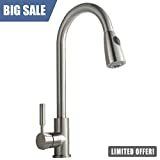 Instead of purchasing water bottles daily and adding to plastic pollution, you can buy a kitchen faucet that comes with an in-built water filtration system. It is an expensive investment but saves money in the long run and is eco-friendly as well. Always purchase a kitchen faucet with an aerated spout as it is a huge water-saver. It mixes water with air to create an illusion that a lot of water is flowing out of the faucet. If you want go a step ahead, you can purchase a touchless electronic faucet, as it shuts the water flow automatically when no one’s using it. A basic style, the single handle faucet is the perfect choice for a small kitchen sink. Go for this choice only if there is a lot of distance between the faucet and the wall or window behind it shouldn’t hit anything while the faucet rotates. Double handle faucet is most traditional kind of faucet you will find. One handle is for cold water, while the other one is for hot water. You can mount the handles separately or they come attached to the baseplate. Adjusting the water temperature is more efficient with a double handle faucet. Commonly found in restaurant kitchens, a pot-filler faucet is a wall-mount faucet that is installed over or near the stove. You can move it around easily and fold the articulated arms when not in use. It is a convenient choice when you want to fill up the entire pot as you can place it on the stove and fill it up. Bar faucets are used as secondary faucets in high-end kitchens but you can use it as the primary faucet in your RV kitchen. It is smaller than an average-sized kitchen faucet and takes up very little space. A pull-out & pull-down faucet is a single handle faucet with a detachable hose and spout. A magnetic lock holds the hose in position when you aren’t using the feature. It makes cleaning of fruits, vegetables, and meat an easy task. Cleaning the sink is also convenient as it reaches all parts of the sink easily. Built with advanced technology, a hands-free faucet has an activator in the front to start and shut the flow of water. You can deactivate the feature and turn the faucet into a manual one whenever you want. Modern kitchen faucets come with many attractive features that make our lives more comfortable and luxurious. Chrome is the most durable and common faucet finish. You can go for more expensive bronze or nickel finishes as well. Single handle faucets can maintain a pre-set temperature. A double handle faucet has two faucets that can help you adjust the temperature. The faucet comes fitted with a button on top to switch between spray and stream water mode. The on/off position looks the same, but you can run water to check which mode is active. 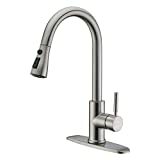 A stylish RV kitchen faucet with chrome finish, RV Non-metallic Kitchen Faucet has an 8” ABS frame. It is lightweight and easy to install, making it an ideal choice for RV or travel trailers. It comes with ½” threaded male inlet shanks, which can easily fit in the standard ½” flex lines of the sink valves. The two handle faucet rotates 360 degrees, so make sure it doesn’t hit the wall or window behind as it will weaken the build. 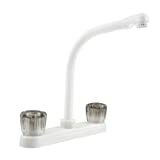 It comes fitted with a metal aerator, which helps to save water and adds force to the flow. The faucet has lever handles only turn a quarter for better temperature control and smooth operation. This Pull-out Kitchen Faucet is a stylish and elegant faucet ideal for RV homes. The water line hose and pull down hose come preinstalled with the faucet, which makes it easy to install. You can fit it yourself in less than 30 minutes without requiring fancy plumbing instruments. It comes with an extendable hose that extends up to 20 inches, enabling an easy and thorough clean. The faucet’s most attractive feature is the Multifunctional Outlet Water Effect, which is a three-way spray setting — spray, stream, and pause. You can use the stream function for filling water, spray for cleaning the sink and produce, and pause for stopping the flow when your hands are full. It is coated with a corrosion-proof and dust-proof finish, making it easy to maintain. 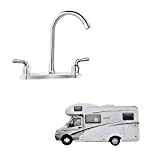 An RV / Travel Trailer Kitchen Sink Faucet by Wholesale Plumbing, the kitchen fixture is available in three finishes. These include stainless steel, chrome, and oil-rubbed bronze. Wholesale plumbing is one of the few companies that offer a five-year warranty on their RV kitchen fixtures. It has a brass spout that rotates 360 degrees, while the waterways and the washerless cartridge is constructed using lightweight premium quality plastic. It has non-metallic waterways, which protect the faucet from catching rust and prolongs its life. The faucet comes with ½” threaded male water inlet shanks, which fits into a standard size sink valve size. It is 14.5” in height and complements traditional kitchen decor. It comes fitted with a metal aerator, which you can take out if you don’t need it. This RV Hi-Rise Kitchen Faucet is an affordable product fitted with an elegant spout and two smoked crystal acrylic knobs. You can use the knobs to adjust water temperature and pressure. The high-rise design of the faucet fits into an RV kitchen effectively. It offers the aerated water flow feature and is fitted with top quality lightweight synthetic waterways. You have a choice to choose between two colors, which are white and bisque parchment. The knobs are easy to rotate, a smooth mechanism that prevents unwanted water dripping. It only fits on a sink with two-hole openings. The entire faucet is 10” tall, while the knobs are 3” tall. It is easy to install and takes very little space, making it an excellent choice for RV kitchen. Fitting both 3/8" and 1/2" water supply hose. Quick connector make sure leak-proof. Easy to install and corrosion-resistant, this extendable pull out kitchen faucet is a perfect choice for a modern, contemporary kitchen. You don’t need a base plate for the installation, but if you want, you will have to purchase it separately. The faucet has a high-arc gooseneck design, which rotates 360 degrees. It is fitted with a drip-free ceramic cartridge and a pull-out hose that extends up to 20 inches, which allows you to clean all corners of the sink. The top of the water outlet has the stream/spray button, which you can use to activate the ABS aerator. The single handle faucet allows easy handling of the water temperature. It is finished with durable nickel brush finish that resists corrosion and tarnish. It is fitted with both 1/2” and 3/8” water line size, so you can choose according to your RV’s water supply line. This RV kitchen faucet is a clear winner and best choice for us in our trailer. It’s priced fair, and it’s the best one out there. The spouts turn 360 degrees, has a 20” extendable hose, and a simple mechanism to adjust water pressure and temperature. The three-way spray setting also helps to save water when it’s not readily available out boondocking in the hills and country side.